Figure 1. 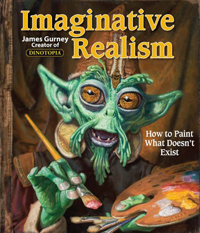 Book Cover - Imaginative Realism: How to Paint What Doesn't Exist by James Gurney. Figure 2. The artist in his studio. Photograph courtesy of James Gurney. Imaginative Realism: How to Paint What Doesn't Exist by James Gurney. Andrews McMeel Publishing, 2009, 224 pages. In the introduction to Imaginative Realism, James Gurney writes, “This problem (of drawing from imagination) always puzzled me as a young artist. I liked to sketch from observation, but I couldn’t find many books that explained how to develop my imaginative muscles.” This sentiment will ring true for those of us who have struggled with the convincing depiction of things we cannot see. In this book Gurney shares with the reader his years of experience exercising those imaginative muscles in the design of imaginary creatures, places, and events. An award-winning author and illustrator, James Gurney is perhaps best known for the book series Dinotopia, in which he has beautifully conceived, in painstaking detail, a world shared by humans and dinosaurs. 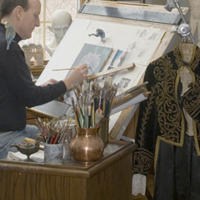 In Imaginative Realism, Gurney describes many of the techniques explored in illustrating the Dinotopia series, as well as a number of commissioned works. The book is divided into 13 chapters in which Gurney systematically breaks down his illustrative process. He begins by situating his work within the tradition of imaginative painting, paying homage to the great masters, and highlighting the practice of copying from the masters, which he describes as “the shortest path to understanding.” He devotes a large portion of the book to explaining his process of sketching, shooting photographic references, and creating maquettes, describing the role of each in informing his final paintings. Many of Gurney’s examples are drawn from his weblog (gurneyjourney.blogspot.com) in which he generously shares his experiences as an illustrator. In particular Gurney’s architectural models are very impressive. It’s his attention to detail during these preliminary stages that make his illustrations so convincingly realistic. Carefully lit maquettes provide invaluable information about the subtleties of light and shadow. He also describes the value of photographic references in his work, but warns against the pitfalls associated with relying too heavily upon them, providing great examples to illustrate his point. In addition to describing techniques for creating environments from the imagination, Gurney devotes a chapter of his book to compositional devices. He discusses the importance of tonal relationships in composition, supporting this discussion with many beautiful, well-annotated illustrations. Where traditional descriptors are lacking, Gurney has invented his own vocabulary to identify various approaches to composition. Terms like “windmill principle” and “clustering” are used to describe techniques commonly used by artists but previously not well defined. While Gurney’s techniques utilize traditional media, the same principles apply to the creation of imagery in the digital realm. Declares Gurney, “regardless of your medium, there are no shortcuts to research and planning.” Gurney’s book offers medical illustrators a wealth of resources for planning and executing illustrations of theoretical or imagined subject matter. Moreover, Imaginative Realism is an impressive testament to the rich tradition of illustration. It will make you want to step away from your computer, take up your sketchpad, venture outside, and draw!